Poldark actor Aidan Turner is to swap his scythe for a cut-throat razor in a new stage production that will see him play a psychotic Irish terrorist. The 34-year-old will make his West End debut next year in The Lieutenant of Inishmore, a violently dark comedy by the Oscar-winning Martin McDonagh. Set in Ireland in 1993, the play tells of a paramilitary who exacts bloody retribution when his cat is murdered. The play runs at London’s Noel Coward Theatre from 23 June to 8 September. The production is one of two shows being mounted in the West End next year by Michael Grandage’s theatre company. 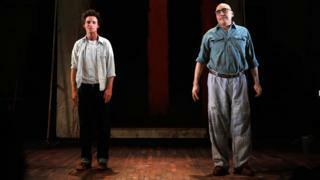 The other sees Alfred Molina reprise his Tony-nominated role as painter Mark Rothko in John Logan’s 2009 play Red. Grandage’s original production at London’s Donmar Warehouse transferred to Broadway in 2010 and won a Tony for best play. But the revival will not see Eddie Redmayne reprise his Tony-winning role as Rothko’s assistant Ken, who will be played instead by Alfred Enoch. Red, a reference to Rothko’s bold use of primary colours in his expressionist paintings, runs at the Wyndham’s Theatre from 4 May to 28 July. Grandage previously directed a production of McDonagh’s The Cripple of Inishmaan with Daniel Radcliffe in 2013.